With more than 400 locations in the southern United States, RaceTrac is always there for its guests who need to refuel both their vehicles and their bodies. Founded in 1934 as a chain of gas station and convenience stores, the company offers guests fully stocked food and beverage options at a great value – for people on the go or those looking to unwind and take a break during a road trip. 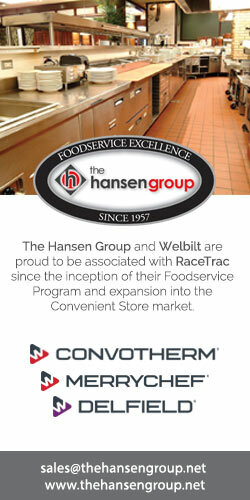 While RaceTrac has a long history of offering customization options for guests, it continually evolves with the times. Its wide array of options reflects its attention to what the everyday customer wants, needs and expects from a convenience store location – with some bonuses to make their day even better. RaceTrac’s mission is to make people’s lives simpler and more enjoyable. But if every location is different inside and out, then that can take away from the simplicity. Therefore, the company is upgrading and remodeling its stores to reflect that simplicity and give guests a consistent experience across the board. “This will allow us to have a predictable guest experience and be able to really systemize the processes in the store so we can deliver that consistent experience regardless of a guest’s location,” Director of Food and Beverage Steven Turner says. RaceTrac’s service offerings that will be standardized across all stores include Swirl World, a frozen treat concept with up to 10 flavors of frozen yogurt and ice cream (with swirling potential) and more than 40 customizable toppings that includes candies, chocolates, fruits, nuts and more, which is already available in one-third of its stores, along with its expanded coffee bar that offers seven different blends of coffee with an expansive collection of creamers, sugars, marshmallows and cinnamon to add to every beverage. While today RaceTrac offers wraps, sandwiches and other items in its sandwich cooler, soon, the company will add another key service piece - a working kitchen to offer made-to-order pizzas, wraps, sandwiches and other hot items. One challenge RaceTrac was sensitive to during its upgrades was to ensure it did not alienate the traditional convenience store customer. Despite adding seating and fresher, made-to-order products, the company’s grab-and-go guests will still be able to get in and out as quickly – if not quicker – than ever before. RaceTrac is a competitive organization, always wanting to improve upon the previous day. “We have an insatiable thirst for growth and education,” Posener says, noting that RaceTrac is on a path to grow 10 percent annually and open 40-plus stores every year. It’s not just about the consumers; RaceTrac wants its employees from the Store Support Center to all of its store locations to not only thrive in their careers, but to enjoy coming to work every day. The company calls it “The RaceTrac Way,” which is its culture of possessing a warrior’s passion, humble attitude and living for fun every day. “There will be hard days, of course, but in general the feeling of having fun and enjoying what you’re doing spans across our Store Support Center and in the stores,” Isbill says. In addition, everyone in the company goes through store training. RaceTrac believes it’s important that team members at all levels understand the hard work store-level teams do as the face of the brand, delivering a high-quality experience to its guests on a daily basis. After 10 years of research and development, RaceTrac launched its new rewards program on April 1: RaceTrac Rewards. By using the smartphone app, RaceTrac guests earn points with nearly every purchase in-store or at the gas pump and move up the loyalty rankings. Each loyalty rank is associated with a different level of RaceTrac “royalty” – from Duke of Hot Dog to Prince of Pastry and King of Coffee to Sultan of Soda. Each rank offers different rewards to redeem – and naturally, the more points earned, the better the rewards. The app also features a store locator that lists the closest stores by mile and includes each store’s gas prices and amenities offered.